Make sure you get all the facts when choosing an fitness ball. The 3 most important things to consider are size, quality and comfort. The beauty is that these vinyl air-filled balls are inexpensive, don’t take up much room, are portable and can be easily purchased from health and fitness stores or more conveniently on the internet. Most exercise balls are matched to your height. The general rule is when sitting on the ball your hips and knees should be bent at a 90 degree angle and your feet should be flat on the floor. The only exception would be when doing Pilates. Then a 55 cm ball is usually the recommendation unless you are very tall. When you are inflating your fitness ball make sure you fill it up until it reaches the manufacturers recommended size. For example, if you purchase a ball that is 55 cm in diameter, fill it until it reaches that diameter, but not any bigger. 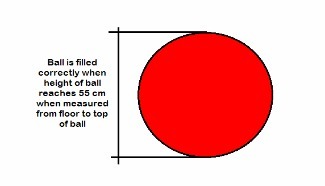 If you want to check how accurately the ball has been inflated, take a measuring tape, starting from the floor and go to the height of the ball. Place a flat stick level on top of the ball and meet it up with the tape measure. When it has reached 55 cm in height, it is good. Not all balls are created equal. Most fitness balls will get the job done but always look for the ones that are burst resistant. That way if you accidentally role over anything sharp your ball will not burst, instead it will gradually deflate. Some balls are more durable and have a better surface for slip prevention to make your exercise experience more pleasurable. When purchasing an exercise ball, you really do get what you pay for. Fitness balls are relatively inexpensive and can be purchased anywhere from $16.00 to $45.00. Start your exercise program slowly, and then gradually increase the intensity and times. You will be surprised what an amazing workout you get. You may feel a little sore at first because you are stretching and toning muscles that may not get a regular workout. This will disappear if you stick to a regular routine. Most of all have fun with your new workout routine.